Henry Benjamin "Hank" Greenberg (January 1, 1911 - September 4, 1986), nicknamed "Hammerin' Hank," was an American professional baseball player whose career spanned the years of the Great Depression and World War II. A first baseman primarily for the Detroit Tigers, Greenberg was one of the premier power hitters of his generation. He hit 58 home runs in 1938, equaling Jimmie Foxx's right-handed record from 1932. The record for right-handers stayed at 58 until 1999 when Mark McGuire and Sammy Sosa both broke it. He was a five-time All-Star, was twice named the American League's Most Valuable Player, and was elected to the Hall of Fame in 1956. Despite losing four prime seasons to World War II and another to a fractured wrist, Hank Greenberg still hit 331 home runs, including 40 or more on four occasions. His 183 Runs Batted In (RBI) in 1937 still stands as the third highest one season total behind Hack Wilson (191) and Lou Gehrig (184). He was also the first player ever to win the MVP award at two different positions. Greenberg was one of the first Jewish superstars in American professional sports. He garnered national attention in 1934 when he refused to play baseball on Yom Kippur, the Jewish day of atonement, even though the Tigers were in the middle of a pennant race. In 1938, two years after Hitler refused to allow Jews to play in the Olympics and two months before Kristallnacht occurred in Germany, Greenberg was vying to break Babe Ruth's home run record. His baseball career also converged with world politics when he became the first star ballplayer to be drafted into the U.S. Armed Forces in 1941. Greenberg was born in New York City to Romanian-born Jewish immigrants who owned a successful cloth-shrinking plant. His father and mother met in America and were married in New York. Hank had two brothers, Benjamin, four years older, and Joseph, five years younger, and a sister, Lillian, two years older. By the time Hank was six, his father's business had grown enough to enable them to move to the Crotona Park section of the Bronx. Since Crotona Park was a predominantly Jewish section, Greenberg knew practically nothing of anti-Semitism. Greenberg lacked coordination as a youngster, and flat feet prevented him from running fast. But he worked diligently to overcome his inadequacies. His preferred sport was baseball, and his preferred position was first base. He became a basketball standout in high school, helping James Monroe High School win the city championship in 1929. After graduation from high school in 1929, he played semi-pro baseball for the Red Bank (New Jersey) Towners and later with Brooklyn's Bay Parkways. It didn't take long for major league scouts to become interested in him. He was first approached by a Yankee scout but Greenberg didn't relish the idea of being Lou Gehrig's backup first baseman. Instead, he signed with Detroit in September of 1929 for $9,000, feeling he would have a better chance of becoming their first baseman. Part of the deal was that he would attend New York University. After only one semester, he dropped out to concentrate fully on baseball. After playing one game with the Tigers in 1930, Greenberg spent the rest of the year playing for Hartford of the Eastern League (.214 in 17 games) and Raleigh of the Piedmont League (.314 with 19 homers). In 1931, he played for Evansville of the Three-I League (.318, 15 homers, 85 RBIs). In 1932 he played for Beaumont of the Texas League where he began his legacy as a slugger, hitting 39 homers and winning the league MVP while leading Beaumont to the Texas League title. He also batted .290 and drove in 131 runs. When Greenberg joined the Tigers in 1933 Bucky Harris, the manager, refused to play Greenberg because he favored Harry Davis, a slick fielding but light hitting first baseman. Harris placed Greenberg at third base with disastrous results. Greenberg, unhappy with the situation, went to Frank Navin, the owner of the Tigers. Navin worked out a compromise where Greenberg would bat against left-handed pitching and Davis would bat against right-handed pitching. Greenberg played in 117 games, batted .301, hit 12 homers and drove in 87 runs. In 1934, Harris was gone and Mickey Cochrane took over as manager. Greenberg and Cochrane hit it off immediately. Cochrane showed his confidence in Greenberg by selling Harry Davis. Greenberg repayed that confidence by leading them to their first pennant since 1909 with .339 average, 139 RBIs, 63 doubles, and 26 homers. They played the St. Louis Cardinals Gas House Gang in the 1934 World Series and lost to them in a seven-game series. Greenberg batted .321 in the series but struck out nine times, seven coming with men on base. The 1934 Tiger team would send four players to the Hall of Fame: Goose Goslin, Mickey Cochrane, Charley Gehringer and Hank Greenberg. The Tigers' infield, known as the Battalion of Death, drove in 462 runs, and the Tigers as a team scored 958 runs with only one team coming within 150 runs of that total. Collectively Greenberg, second baseman Charley Gehringer, shortstop Billy Rogell, and third baseman Marv Owen combined to bat .327 with 48 homers and 462 RBI. Everyone in the infield drove in 100 runs or more except Owen, who batted in 96. Detroit Tigers 1934 infield. 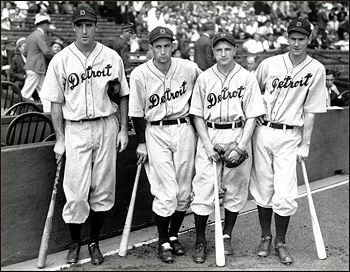 From left to right: Hank Greenberg, Charlie Gehringer, Billy Rogell, and Marv Owen. It was also during the 1934 season that Greenberg faced a religious dilemma. September 10 was Rosh Hashanah, and the Tigers, who led the league by four games in the standings, were playing the Boston Red Sox. Fans and rabbis debated whether Greenberg, who by his accomplishments on the field was winning acceptance for Jews among non-Jewish Americans, should play on the High Holy Days. Greenberg came up with his own compromise: He played on Rosh Hashanah and hit two home runs that won the game, 2-1; ten days later, he spent Yom Kippur in a synagogue, and the Tigers lost. Greenberg, in 1935, slugged 36 homers (tied with Jimmie Foxx for the Al title), drove in 170 runs and helped the Tigers to return to the World Series against the Chicago Cubs. He was named the Most Valuable Player in the American League that season. He also set a record (still standing) of 103 RBIs at the All-Star break - but was not selected to the AL All-Star Game roster. In his second World Series in his first three years in the majors Greenberg seemed destined for greatness. However, in the second game of the series, Greenberg's broke his wrist in a play at home plate. He could not continue in the series but the Tigers still managed to win the Series from the Cubs. It was the first World Series title for the Tigers in five tries. Twelve games into the 1936 season Greenberg had 16 runs batted in the first 12 games, but he broke the same wrist when he had a collision with Washington outfielder Jake Powell. Many felt that Hank's baseball career was over as he sat out the rest of the season. In 1937 Greenberg ended the speculation by batting .337 with 200 hits, 40 homers (second to Joe Dimaggio's 46) and 183 RBIs, one shy of the American League record held by Lou Gehrig. Greenberg was also voted on to the All-Star Team and on Sept. 19 he hit the first-ever homer into the center field bleachers at Yankee Stadium. During 1938 Greenberg was in pursuit of Babe Ruth's home run record of 60. During his chase, he had multiple homers in one game 11 times, a record that still stands (it was tied by Sammy Sosa in 1998). With five games left in the season, Greenberg had 58 homers. He failed to hit another one. He also led the league in runs scored (144) and at-bats per home run (9.6), tied for the AL lead in walks (119), was second in RBI (146), slugging percentage (.683), and total bases (380). Greenberg came in third in the vote for MVP. 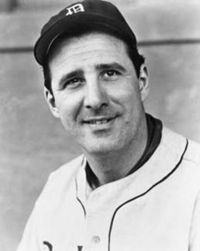 In 1939 Greenberg was voted to the All-Star Team for the third year in a row. He was second in the league in home runs (33), third in the AL in doubles (42) and slugging percentage (.622). After moving to the outfield in 1940, Greenberg was voted to the All-Star Team for the 4th year in a row. He led the league in home runs (for the third time in 6 years with 41), RBIs (150), doubles (50), total bases (384), and a .670 slugging percentage (44 points ahead of Joe DiMaggio). He was second in the league behind Ted Williams in runs scored (129) and OBP (.433), all while batting .340 (5th best in the AL). He led the Tigers to a pennant, and won his second American League MVP award, becoming the first player ever to win the MVP award at two different positions. Greenberg, then a bachelor, was one of the first major leaguers inducted into the service, entering 19 games into the 1941 season. He was inducted for a one-year draft in the United States Army at age 30, gaining an honorable discharge on December 5 of that year after the United States Congress released men aged 28 years and older from service. Two days later, the Japanese bombed Pearl Harbor and Greenberg re-enlisted and volunteered for the United States Army Air Forces. He graduated from Officer Candidate School and was commissioned as a First Lieutenant. He eventually served overseas in the China-Burma-India Theater of World War II. Halfway through the 1945 season, Greenberg was released from the Air Force with the rank of Captain, four battle stars and a Presidential Unit Citation. Greenberg had hardly swung a bat for four-and-a-half years. Greenberg returned to the Tiger lineup in July of 1945. He homered in his first game. The Tigers were in a tight pennant race with the Washington Senators, one that came down to the end of the season. His grand slam on the final day of the season won the pennant for the Tigers. In the World Series win over the Chicago Cubs, he hit two more homers and batted in seven runs. He led the AL in both homers (44) and RBI (127) for the fourth time in 1946, but a salary dispute developed with the Tigers during the season. When Greenberg decided to retire rather than play for less, Detroit sold his contract to the Pittsburgh Pirates, the National League's worst team. To persuade him not to retire, Pittsburgh made Greenberg the first baseball player to earn over $100,000 in a season. A bullpen was built in front of Forbes Field's distant left field wall and fans quickly labeled it "Greenberg Gardens." Although he hit a disappointing .249 in 1947, he contributed 25 home runs. Even though he was only eighth in the league in home runs he became the first major league player to hit 25 or more home runs in a season in both leagues. He also served as hitting instructor and adviser to his protege and friend, young Ralph Kiner. Future Hall of Famer Kiner led the NL in home runs from 1946-1952. Injuries began to get the best of Greenberg and he retired at the end of the 1947 season. His career totals for nine-and-a-half years were impressive: 1,394 games, 1,628 hits, 1276 runs batted in, a .313 lifetime batting average, 331 homers, 1051 runs scored, 379 doubles, and an amazing .605 slugging average. Only Babe Ruth, Ted Williams, Lou Gehrig, and Jimmie Foxx were ahead of him in the all-time slugging percentage department. A rarely mentioned record that Greenberg shares with Babe Ruth was his 96 extra-base hits or more in four different seasons: 96 in 1934, 98 in 1935, 103 in 1937, and 99 in 1940. Ruth is the only other player to have 96 or more extra-base hits in four different seasons. Gehrig had 2, Joe DiMaggio had one, Jimmie Foxx had one, and Rogers Hornsby did it 2 times. Sluggers like Ted Williams, Willie Mays and Hank Aaron never had 96 or more extra-base hits in any season. Baseball fans will forever speculate what his numbers could have been had he not missed those four and a half years. In 1956 he was inducted into the Major League Baseball Hall of Fame. In 1983 the Tigers retired his number '5' uniform. In 1948 Cleveland owner Bill Veeck hired Greenberg as farm system director. He became general manager in 1950 and built the team that derailed the Yankees' string of pennants in 1954. When Veeck sold his interest, Greenberg remained as general manager and part-owner until 1957. Unable to purchase stock in the Indians, he moved to the Chicago White Sox as part owner and vice president as that team won the 1959 pennant. In 1961 the American League announced plans to put a team in Los Angeles. Greenberg immediately became the favorite to become the new team's first owner, and persuaded Veeck to join him as his partner. However, when Dodgers owner Walter O'Malley got word of these developments, he threatened to scuttle the whole deal by invoking his exclusive rights to operate a major league team in Southern California. Greenberg wouldn't budge, and pulled out of the running for what became the Los Angeles Angels (now the Los Angeles Angels of Anaheim). He retired from baseball in 1963 and later became a successful investment banker who made millions in the 1960s bull market. Greenberg retired to Beverly Hills, California. There he became a star amateur tennis player, winning many titles. Greenberg died of cancer in Beverly Hills, California and his remains were entombed at Hillside Memorial Park Cemetery in Culver City, California. He became close friends with a millionaire businessman, Louis Marx and Greenberg would later go into the financial investment business with Marx's brother David. It was through the Marx's, that he met and married Caral Gimbel of the Department Store family on February 18, 1946, three days after signing a $60,000 contract with the Tigers. They divorced after 12 years. Hank gained custody of their three children and moved to New York so they could be near their mother. Hank's older son Glenn took to football rather than baseball and was an outstanding defensive lineman at Yale. Their daughter, Alva is a successful artist and community leader in New London, Connecticut. Steve, their youngest son, was an English major and a fine athlete at Yale. Steve had careers in baseball and in cable sports management. Greenberg's son, Stephen, played five years in the Washington Senators/Texas Rangers organization and is the former deputy commissioner of Major League Baseball(MLB), a position he held from 1990 - 1993. As a lawyer he also represented a number of major league players, and after he left MLB he co-founded the Classic Sports Network in 1995 with Brian Bedol. It was later purchased by ESPN and became ESPN Classic. He was also the Chairman of CSTV, the first cable network devoted exclusively to college sports, which was purchased by CBS in 2006. Greenberg's daughter, Alva has been an artist and community activist in New London, Connecticut since 1980. In 1999, she opened ALVA Gallery and during the following three years acquired and renovated five buildings on State Street. In 2007 she launched the New London Saturday Market at the New London City Pier. Greenberg remarried in 1966 to Mary Jo Tarola, a minor movie actress, (known on screen as Linda Douglas) in Beverly Hills. Greenberg first confronted anti-Semitism in the minor leagues at Raleigh. During the season, one of his teammates, Jo-Jo White, walked slowly around Greenberg, staring at him. Greenberg asked him what he was staring at. White said he had never seen a Jew before. "The way he said it," noted Greenberg, "he might as well have said, 'I've never seen a giraffe before.'" I let him keep looking for a while, and then I said, 'See anything interesting?'" White said, "You're just like everyone else." While at Beaumont in the minor leagues Greenberg was not as much of an oddity as he was in other southern towns because Beaumont had a strong Jewish presence and it is reported that Greenberg attended the local synagogue. When he made it to the majors Jewish fans in Detroit and all around the American League took to Greenberg almost at once, offering him everything from free meals to free cars, all of which he refused. "In the 1935 World Series, the bench jockeying by the Cubs was so vicious that the home plate umpire, George Moriarty, warned the Cubs' dugout to stop," "They wouldn't stop, so Moriarty came back again and cleared the bench. Later on, I talked to Phil Cavarretta, who was a 19-year-old Cub at the time, and he confirmed that they were anti-Semitic remarks coming from the dugout. Later on, Hank told me that they were the kind of anti-Semitic remarks that he had heard every single day of his career, whether it coming was from the opposing dugout or the stands." Greenberg sometimes retaliated against the ethnic attacks, once going into the Chicago White Sox clubhouse to challenge manager Jimmy Dykes, and at another time calling out the entire Yankee team. "When I was playing, I used to resent being singled out as a Jewish ballplayer," he said. "I wanted to be known as a great ballplayer, period...Lately, though, I find myself wanting to be remembered not only as a great ballplayer, but even more as a great Jewish ballplayer. I realize now, more than I used to, how important a part I played in the lives of a generation of Jewish kids who grew up in the 30s." He was elected to the Jewish-American Hall of Fame in 1991. In 2000 Aviva Kempner's award winning The Life and Times of Hank Greenberg debuted with archival footage from the 1930s and 1940s and interviews with Greenberg and many of his Tiger teammates. In 2006, Greenberg was featured on a United States postage stamp. The stamp is one of a block of four honoring Baseball Sluggers, the others being Mickey Mantle, Mel Ott, and Roy Campanella. The Michigan Jewish Sports Foundation has held the Hank Greenberg Memorial Golf & Tennis Invitational since 1990. With the 2008 proceeds the foundation hoped to surpass $1 million in lifetime donations to the Karmanos Cancer Institute. In 2008 a tribute to Hank Greenberg marking the seventy-fifth anniversary of his rookie season in the Major Leagues which took place at the National Baseball Hall of Fame and Museum in Cooperstown, New York. The event was a presentation of Jewish Major Leaguers, Inc., the Newton, Mass., organization that created the two-day "Celebration of American Jews in Baseball" special at the Hall in the summer of 2004. ↑ Hank Greenberg Jewishvirtuallibrary.org. Retrieved July 2, 2008. ↑ The Life and Times of Hank Greenberg Hankgreenbergfilm.org. Retrieved July 2, 2008. ↑ Ralph Berger. Hank Greenberg Bioproj.sabr.org. Retrieved July 1, 2008. ↑ Nick Acocella. 2003. Greenberg was Tiger at the plate Espn.go.com. Retrieved July 1, 2008. ↑ Hank Greenberg Jewishvirtuallibrary.com. Retrieved July 2, 2008. ↑ Nick Acocella. The First "Hammerin' Hank" Espn.go.com. Retrieved July 2, 2008. ↑ Hank Greenberg Baseballlibrary.com. Retrieved July 2, 2008. ↑ Hank Greenberg Bioproj.sabr.org. Retrieved July 2, 2008. ↑ Ralph Berger. Hank Greenberg Bioproj.sabr.org. Retrieved July 2, 2008. ↑ Honesty in a Dramatic and Historic Meeting Mikepalmer.com. Retrieved July 3, 2008. ↑ New York's Glenn Greenberg, Powerful Slugger Squashtalk.com. Retrieved July 2, 2008. ↑ WEDDINGS; Linda Vester, Glenn Greenberg Query.nytimes.com. Retrieved July 2, 2008. ↑ Hedge Fund Toddlers Businessweek.com. Retrieved July 2, 2008. ↑ Leading Media, Internet and Entertainment Executives Form Fusient Media Ventures Redpoint.com. Retrieved July 2, 2008. ↑ Richard Sandomir. 2005. CBS to Acquire CSTV for $325 Million in Stock Nytimes.com. Retrieved July 2, 2008. ↑ ISAAC honors Alva G. Greenberg Sde.ct.gov. Retrieved July 3, 2008. ↑ Ralph Berger. Hank Greenberg Bioproj.sabr.org. Retrieved July 3, 2008. ↑ Greenberg lauded for contributions to baseball Baseballhalloffame.org. Retrieved July 3, 2008. ↑ Nick Acocella. 2003. Greenberg was Tiger at the plate Espn.go.com. Retrieved July 3, 2008. ↑ Jason Maoz. 2008. The Vanishing Jewish Baseball Player Floridajewishnews.com. Retrieved July 3, 2008. ↑ The Life and Times of Hank Greenberg Hankgreenbergfilm.org. Retrieved July 3, 2008. ↑ Baseball Sluggers'Stamps, Postal Cards, Hit grand slam at Yankee Stadium Usps.com. Retrieved July 2, 2008. ↑ Jon Paul Morosi. 2008. Baseball commissioner Selig meets Obama on Michigan visit, reacts to Tigers' struggles Freep.com. Retrieved July 3, 2008. ↑ Tigers legend a role model for generation of Jewish youngsters Baseballhalloffame.org. Retrieved July 3, 2008. The Life and Times of Hank Greenberg Hankgreenbergfilm.org. He Batted for the Tigers, Himself and American Jews Nytimes.com. Sandomir, Richard. 2000. Hank Greenberg and Sandy Koufax in the Mainstream Media Baseball-almanac.com. Moynahan, Brian. 2003. Life and Career of Hank Greenberg Celebrated in Kraft Center Film Presentation Columbia.edu. Goldstein, Bernard. 2001. Honesty in a Dramatic and Historic Meeting Mikepalmer.info. Palmer, Mike. This page was last modified on 26 July 2017, at 16:36.